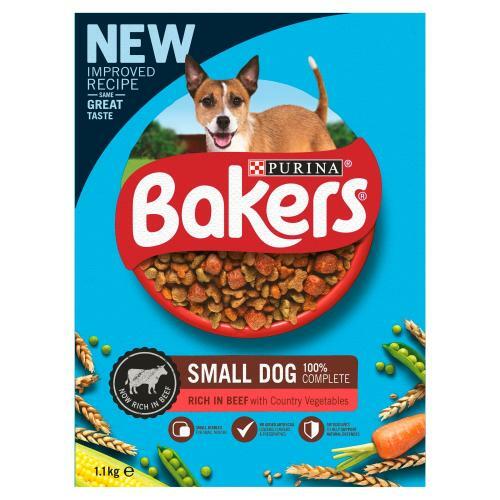 Bakers Complete Beef & Vegetable Small Breed Adult Dog Food has a new, improved recipe that is now rich in beef, with more variety of wholesome wholegrains & country vegetables for quality, tasty goodness. And don't worry, our recipe is still made with the same amazing taste that our BAKERS dogs know & love to gobble up! One half pint mug holds approx. 100g of Bakers Small Dog Adult. To keep your dog in optimal body condition, adjust according to your dog's activity level, physical condition and individual needs. Clean, fresh drinking water should always be available.